AdRoll is a retargeting network that allows you to show ads to visitors who’ve landed on your site while browsing the web. The AdRoll Destination is open-source. You can browse the code on GitHub. This document was last updated on January 26, 2018. If you notice any gaps, outdated information or simply want to leave some feedback to help us improve our documentation, please let us know! The first step is to make sure AdRoll supports the source type and connection mode you’ve chosen to implement. You can learn more about what dictates the connection modes we support here. Search for “Adroll” within the Destinations Catalog and confirm the Source you’d like to connect to. 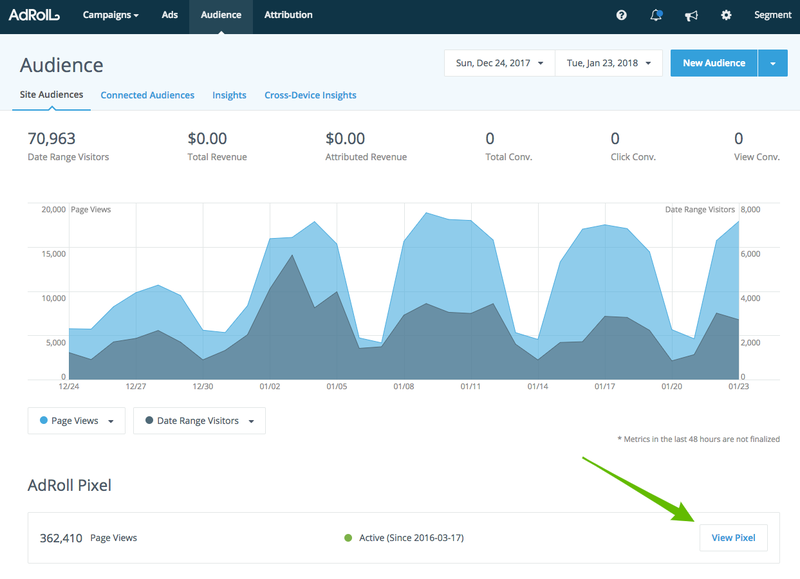 Locate both your AdRoll Advertiser ID and Pixel ID in AdRoll’s “Audience” tab, “AdRoll Pixel” section. Click on “View Pixel”. Your Advertiser ID will be listed beside adroll_adv_id and your AdRoll Pixel will be listed beside adroll_pix_id. 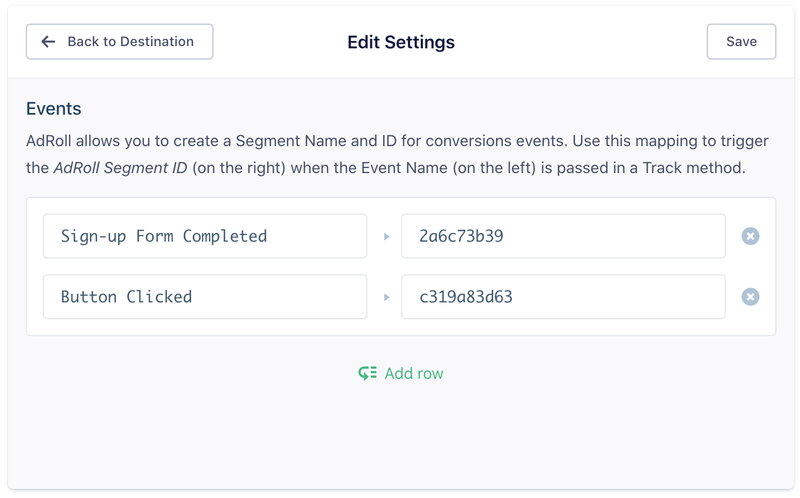 Add both your Advertiser ID and Pixel ID to your Segment Destination Settings. NOTE: The page call must be made on a page for any identify or track events to be sent to AdRoll. Our Analytics.js snippet includes a page call by default so you should be fine, unless you’ve manually removed the page call from your Analytics.js snippet. Set a userId using the identify call which will then be passed it to AdRoll each time a track call is made. If you pass an email trait, we’ll send that to AdRoll by setting window.adroll_email to that value. 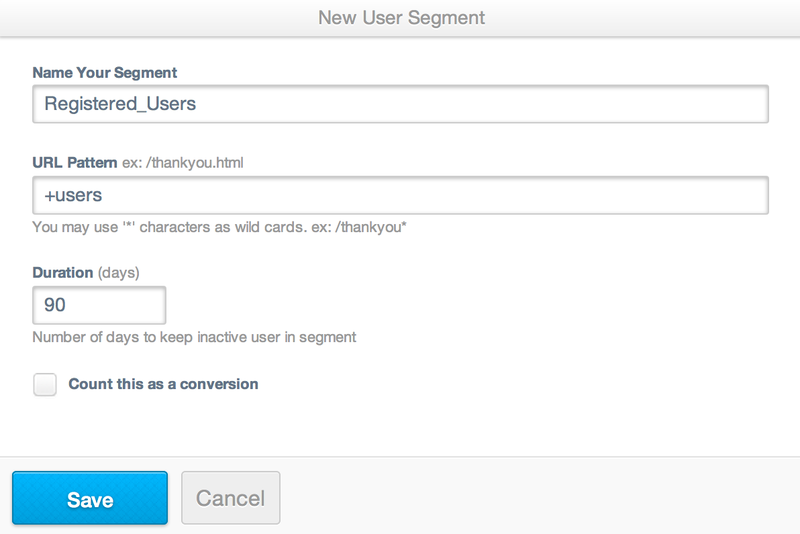 In order to send your track calls to AdRoll for segmenting your users, get started by creating a new “segment” in their interface, copying the “Segment ID”, and pasting that following a + into the URL rule field. Map your client-side Analytics.js event names to the corresponding AdRoll “Segment ID” in the Segment Settings UI. We’ll fire the correct pixel accordingly to put the user into that “segment” whenever they trigger the event you’ve chosen. Note that you will still need to map semantic events like Viewed Product, Added Product, and Order Completed. When you include an event property labeled revenue it will be tracked to AdRoll as adroll_conversion_value. When you send Order Completed event with properties.currency, we will send that as adroll_currency. AdRoll supports these currency codes. If you send an Order Completed event with properties.orderId, we will send that as order_id. If you send a Viewed Product or Added Product with properties.id we will map it as product_id. Prior to rolling out Segment ID’s, AdRoll allowed “named segments”. If your account was created prior to 2015, then the track events you send from the browser via our analytics.track method will be passed on to AdRoll as adroll_segments with the segment being the snake-cased event name.